President Museveni has blamed opposition leaders in Wakiso and Kampala for politically disorienting the youth instead of helping them fight unemployment and poverty. He said that their main job is to fight him instead of working for the people who voted for them. “In entire Wakiso you only remained with only one eye that is [Rosemary] Sseninde. The district is big and should have been with helped if you had voted for NRM leaders. What you did was a mistake,”Museveni said on Thursday in Katabi. Museveni said that it is the role of the leaders to help fight disorientation among the people, a thing he said will help fight poverty and unemployment. 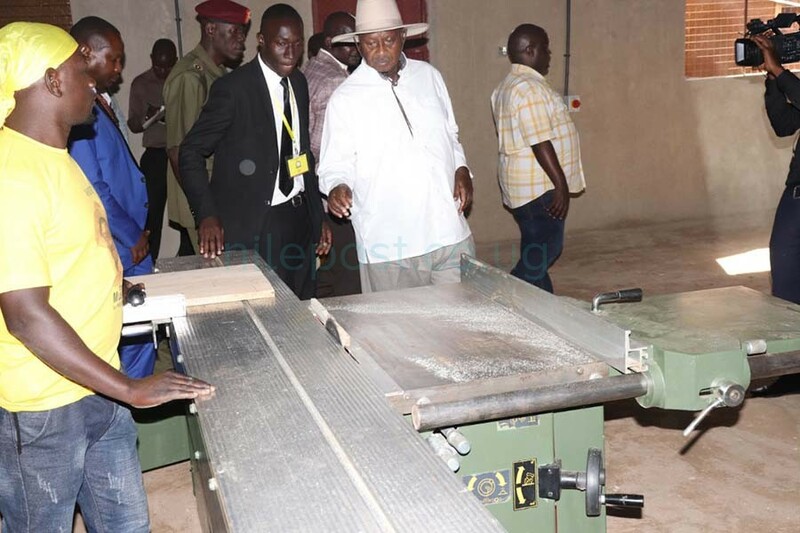 On Thursday, Museveni donated equipment worth millions of shillings to various carpentry and welding saccos in Katabi, Najjanankumbi, Namasuba, Kibuye,Nateete and Busega. Speaking to the youths, he said that Uganda’s biggest problem is not unemployment and poverty but rather sleeping. 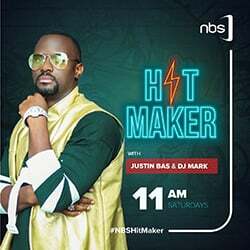 He said that Ugandans are to blame for their own problems for not waking up to tackle them. “Uganda is a rich country because according to URA, we import goods worth US$5 billion every year yet the same can be manufactured here,” he said. According to the president, Ugandans have in the past been giving away money and jobs but later crying of poverty and unemployment. Donning his trademark white locally made long sleeved shirt, Museveni said he saw the light and no longer buys shirts from outside the country but from fellow Ugandans to support them. He noted that by donating equipment and a certain amount in startup capital to various youth saccos, he is not only fighting disorientation among them but also helping them create employment and fight poverty. “In the past people used to buy items from Europe but right now everything is got from Dubai and China because they woke up from slumber land,”Museveni said. 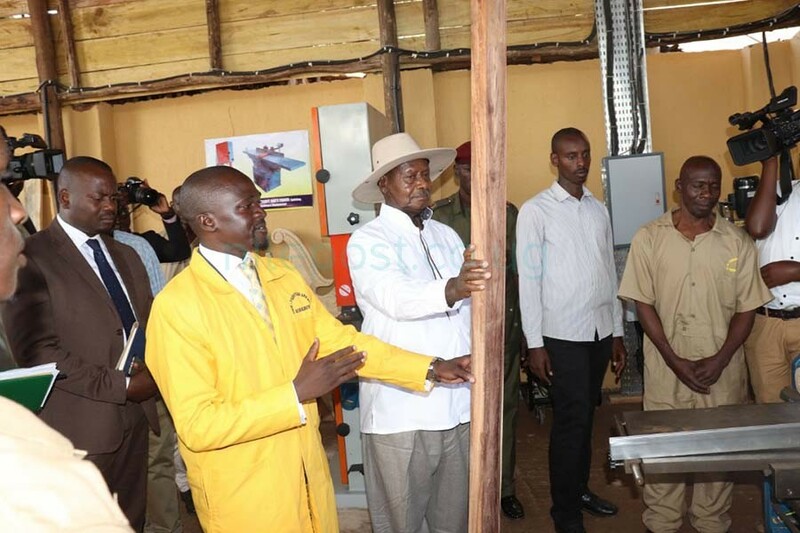 Museveni inspecting projects undertaken by Katabi youth. Speaking to Nile Post, Yusuf Kiryowa, the chairman Katabi town welders’ association said in the past, they had to make use of machines from Kampala which he said was costly and time consuming. “With the new equipment, the money and time we would spend in Kampala would be saved. We will now employ and train more people to get skills that will move them out of poverty,”Kiryowa said. 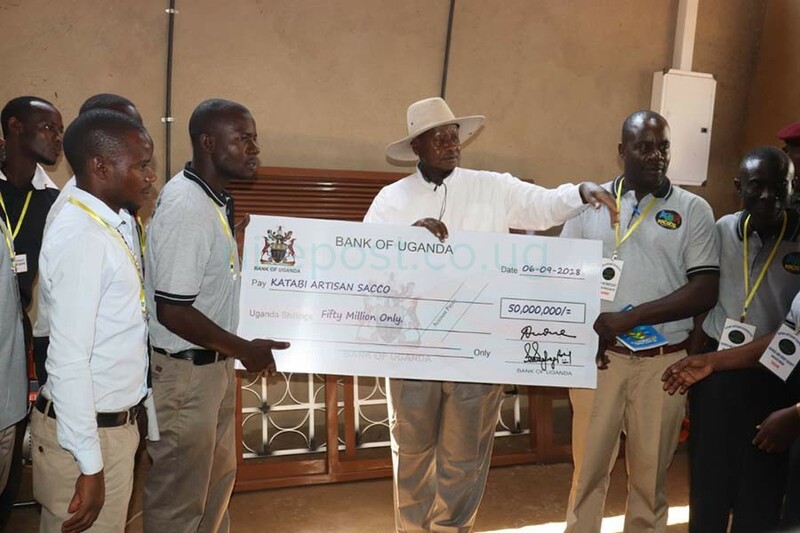 The State House Comptroller, Lucy Nakyobe revealed that Museveni would roll out the program of supporting youth and women saccos and projects all over the country as the fight against unemployment and poverty rages on.